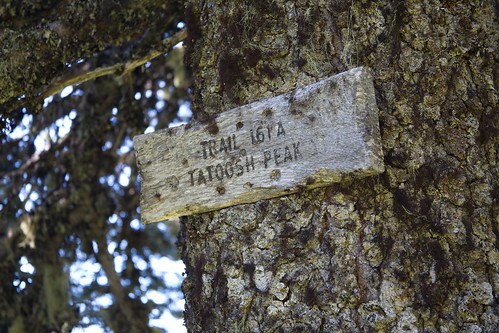 Tatoosh world, a photo by The Bacher Family on Flickr. 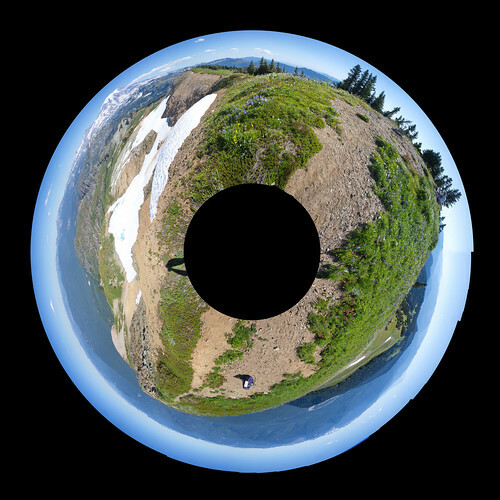 Part of my motivation for taking a 15-shot 360 degree panorama from the summit of Tatoosh Peak was to create this image: a "polar panorama" combining the whole set into a circular image showing the view from this spectacular location as if it were a planet floating in space, or an extreme fish-eye lens view of the scenery. 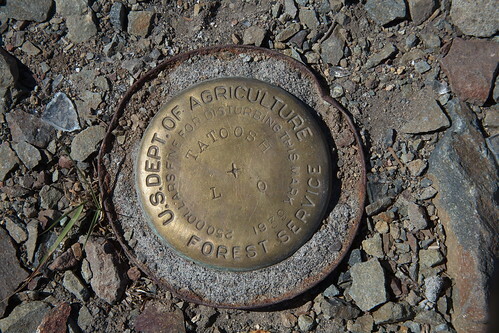 If you were lucky enough to be one of the fire lookouts once stationed on this peak, this would be your world for the duration of your assignment. 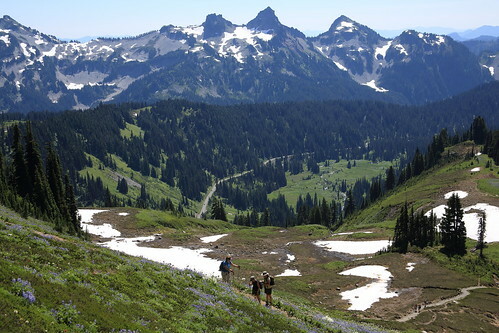 Looking south from Tatoosh Peak, a photo by The Bacher Family on Flickr. Standing on top of the world in theTatoosh Wilderness, how could I not experiment with panoramic photographs? 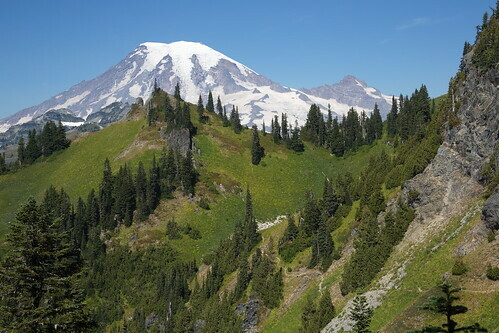 This one's a simple two-photo image looking south from Tatoosh Peak toward Mount Adams. If you like, check out the full collection of panoramas here. Make sure you click on the image or press "L" to see them in Lightroom, full-screen on a black background, for full effect. 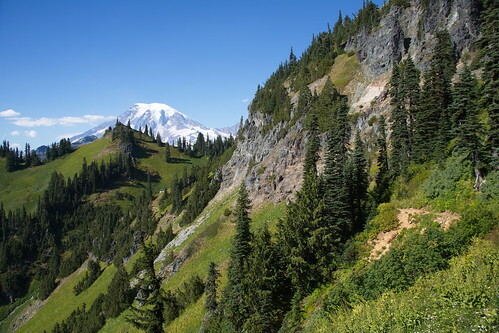 Mount Rainier from the Tatoosh Wilderness, a photo by The Bacher Family on Flickr. The scenery in the Tatoosh Wilderness is spectacular, especially on a golden September day when the light and the grasses and the wildflowers all share the same autumnal hue. 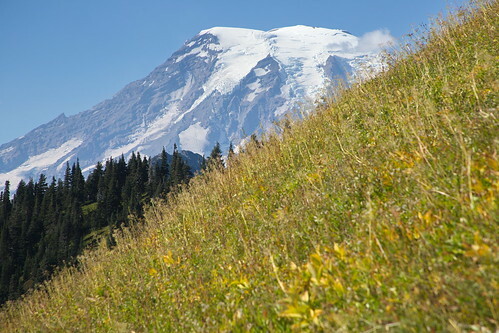 Of the hundreds of photos I took on this particular hike, this one's my favorite, with majestic Mount Rainier rising over the slope of the Tatoosh Range above our trail, in the afternoon light. Collage of color, a photo by The Bacher Family on Flickr. The collage of colors created by subalpine wildflowers never ceases to captivate me. The random splashes of color create an abstract arrangement that has nothing at all to do with geometric composition and everything to do with light and balance and feel. 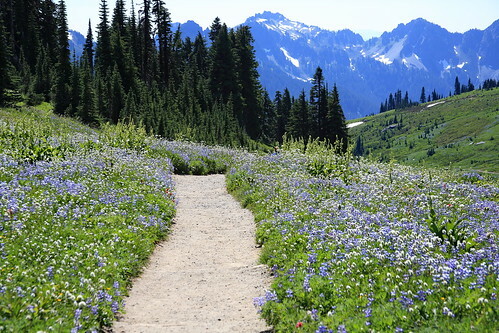 Turnoff to Tatoosh Peak, a photo by The Bacher Family on Flickr. I always love the juxtaposition of human construction with wild nature. The things made by human brains are so often geometric and regular in shape, while nature is relentlessly random and rough around the edges. The longer something human-made remains in the wilderness, of course, the wilder it gets, roughening around the edges and weathering back into something that is once more part of nature. I think that's true of humans themselves, too. We are essentially part of wild nature ourselves, as much as we try to pretend otherwise, and it's worth spending time in the wilderness to restore a little bit of the rough edges that blur the sharp lines we like to create between us and our essential nature. 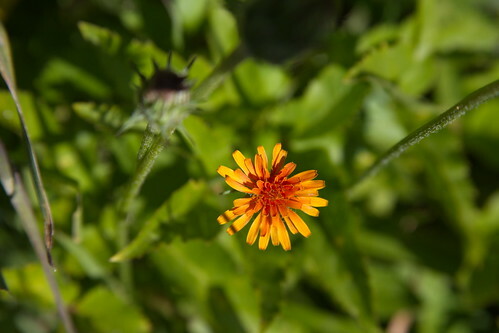 Orange agoseris, a photo by The Bacher Family on Flickr. 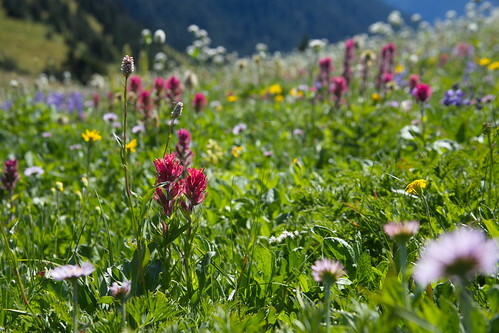 So many different varieties of wildflower carpet the meadows of the Tatoosh Range! 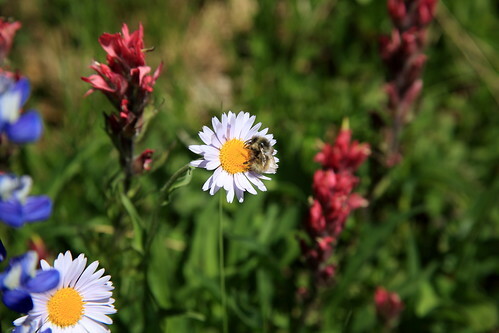 Asters, monkeyflowers, columbines, asters, thistles, lupines, asters, valerians, paintbrush, and more asters! 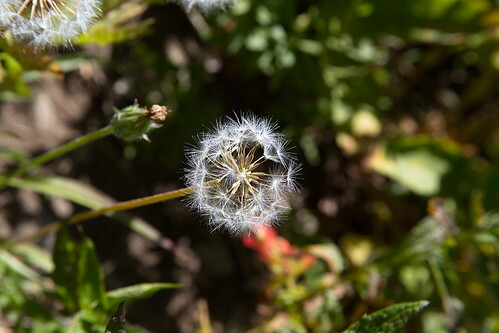 "Aster," of course, is a generic term for a type of plant that features clusters of single-petaled flowers organized in a disc or star shape, each with its own pollen-producing parts gathered in the middle. Yes, the "flower" we see as a daisy or sunflower is actually a great many flowers organized in a large and beautiful circle. The best know asters are yellow, but they may also be white, pink, blue, purple, or, in this case, orange. This one's an orange agoseris, one of my favorite asters for its bright, vivid color. 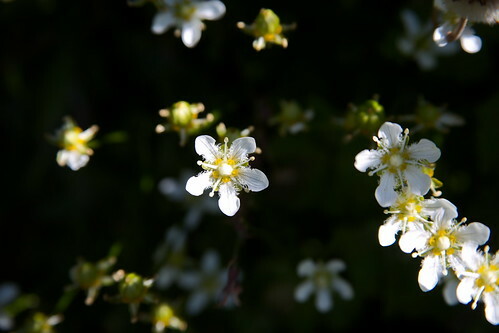 Fringed grass of parnassus, a photo by The Bacher Family on Flickr. 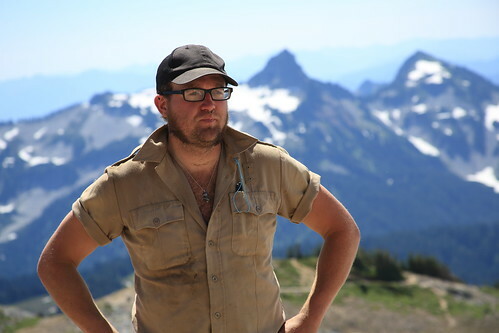 In early September, my good friend Crow joined me on a hike I've been wanting to do for years, climbing up to the crest of the Tatoosh Range on its eastern end. 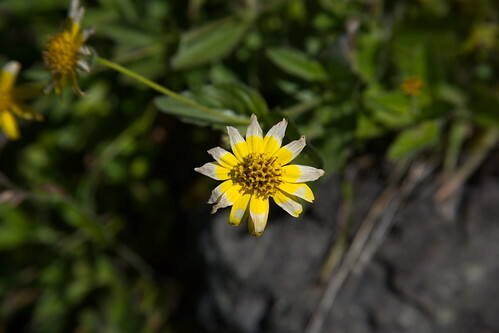 After the long, snowy winter we had last year, many of the wildflowers were still in high bloom, especially at the elevation of the subalpine meadows, while at the same time the grasses were turning amber with the approach of fall. The weather was near-perfect -- a little warm, but clear and sunny and full of light. 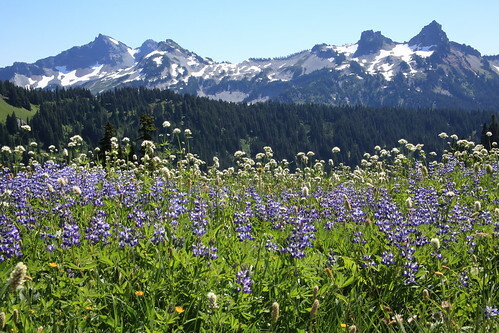 It took us all day to reach Tatoosh Peak and return to our car, and a major reason was the abundance of wildflowers we "had" to stop and photograph along the way. I was especially intrigued by these frilly white blooms, which I had seen before but couldn't quite remember the name of. For the record, they're "fringed grass of parnassis." Like any white flower on a sunny day, they're challenging to photograph in such a way that the whites aren't blown out against the deeper shadows behind them. It was also breezy, which makes any close up photography difficult. Still, I'm pleased with these blooms, captured just where the trail rose out of the deep forest into the subalpine light. 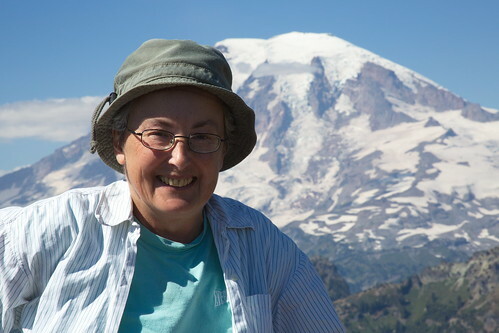 Edith and Myrtle at Mount Rainier, a photo by The Bacher Family on Flickr. 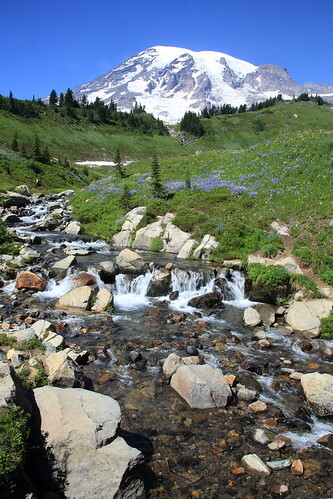 This gorgeous view of Mount Rainier rising over Edith Creek is just half a mile up the trail from the parking lot at Paradise in Mount Rainier National Park. It's a fabulous spot to visit during the summer, when the wildflowers are in full bloom and the water chuckles merrily over the rocks and under the trail bridge. Playing in the water isn't recommended, however, as just behind the camera, almost directly under the bridge, is the 80-foot drop of Myrtle Falls. 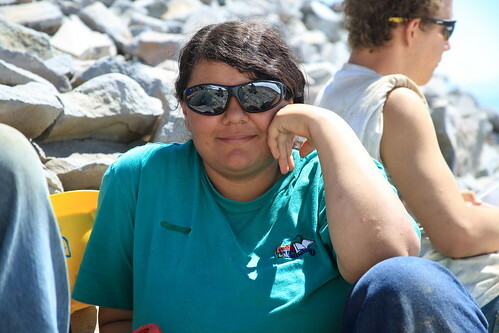 No day at the office, a photo by The Bacher Family on Flickr. Without a doubt, park rangers have some of the most beautiful work settings of any profession. 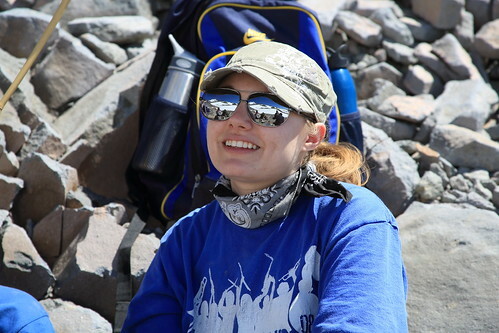 Here's one of our trail maintenance rangers at Mount Rainier National Park, hiking out along the Skyline Trail to check on a crew of Student Conservation Association interns working on trail repairs. 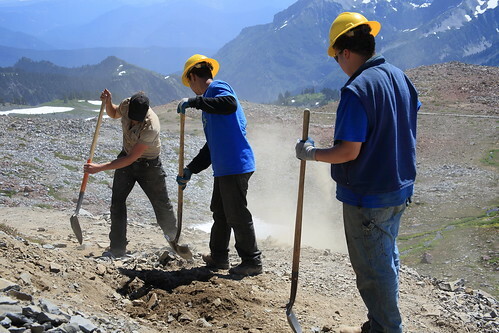 Here's John Longsworth, Washington Trails Association crew leader, along the Skyline Trail in Mount Rainier National Park, at work supervising a Community Crew from the Student Conservation Association. The Tatoosh Range is in the distance behind him. A mirror of the sky, a photo by The Bacher Family on Flickr. 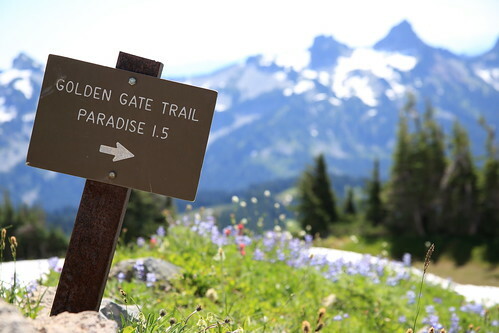 I take you back to a hot, sunny day in mid-August at Mount Rainier National Park, with the wildflowers in peak bloom on the Golden Gate and Skyline Trails. 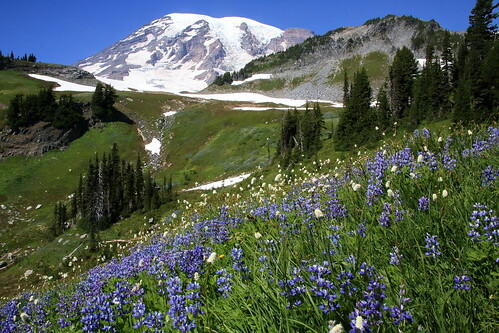 This is one of my favorite readily-accessible views of Mount Rainier, across the shoulder of the slopes at the head of Edith Creek, and I love the way the deep blue and purple of the Cascade lupine mirrors the deep blue of the sky. John Walsh, Meadow Rover, a photo by The Bacher Family on Flickr. 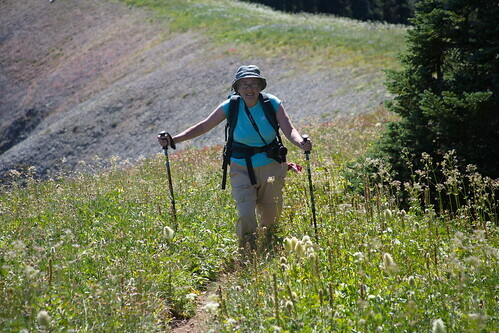 One of the most popular volunteer jobs at Mount Rainier National Park is that of "Meadow Rover." 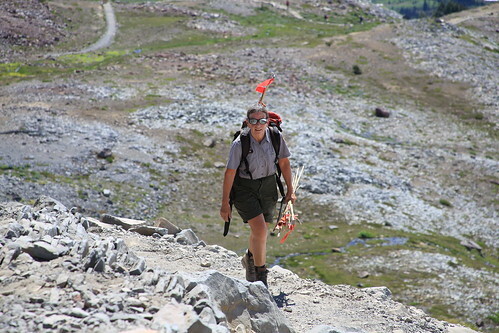 These dedicated volunteers patrol the trails above Paradise and Sunrise, assisting visitors, answering questions, and most importantly, educating people about the importance of staying on trails in the fragile subalpine meadows. 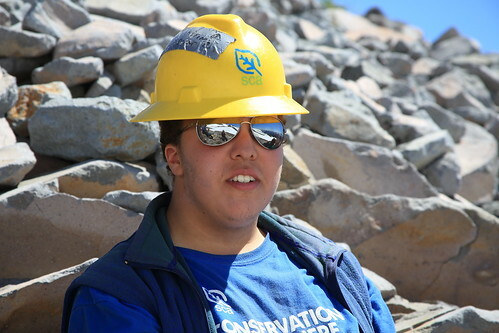 They protect our National Park through education... and they have the best "office" in the world! 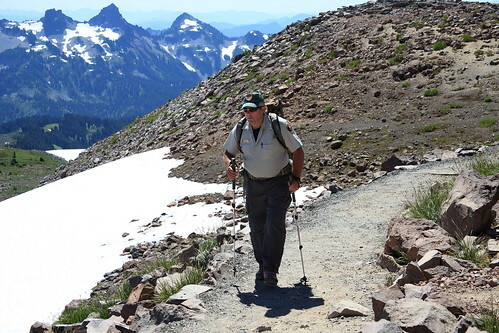 Here's John Walsh, on the job on the Skyline Trail, with the Tatoosh Range in the background. 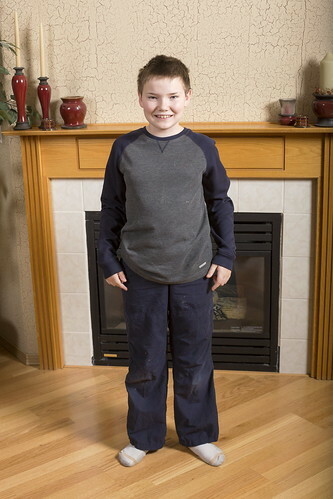 One hot marmot, a photo by The Bacher Family on Flickr. The meadows of Paradise Valley in Mount Rainier National Park are full of life in the summer months: marmots and pikas scurrying around nibbling flowers, bees and butterflies flitting from one bloom to the next, and of course the wildflowers themselves, clothing the landscape in places with a fantastic coat of many colors. 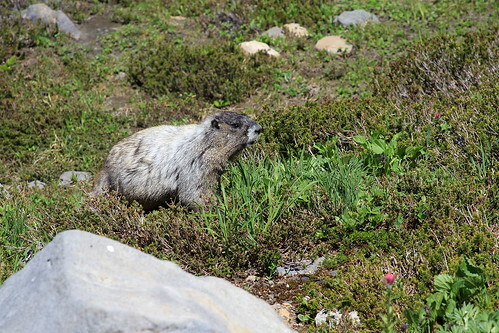 This little fellow, a hoary marmot, was mostly intent on finding a refuge from the heat on a midsummer day. After literally crossing my path, he (or she?) made straight for a lingering patch of snow (it was, after all, only mid-August, and the snow hadn't fully melted yet) and laid down as flat as I've ever seen an animal lay, putting as much body surface on the cold snow as he possibly could. 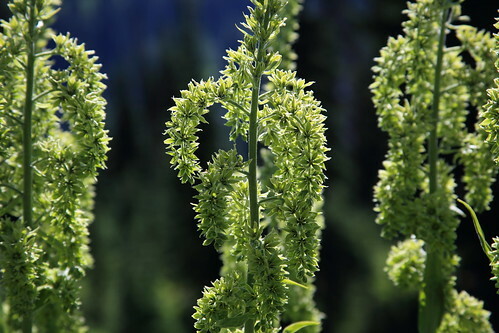 The false hellebore's blooms are tiny and yellow-green, hidden inside larger but still small sepals in long hanging clusters descending from a tall stalk. 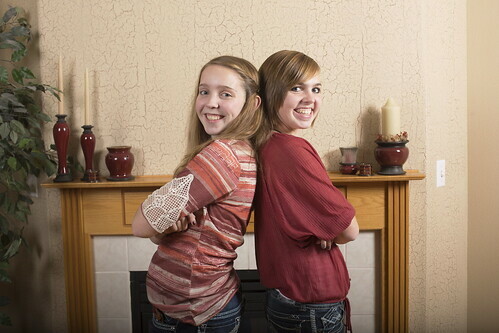 Long-term study, a photo by The Bacher Family on Flickr. 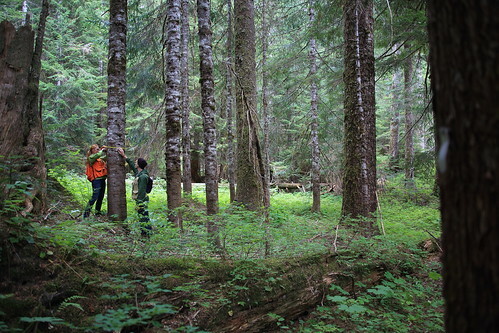 As I hiked along the Eastside Trail one August day, in search of a volunteer group rumored to be at work in the vicinity, I came across, instead, a research team surveying a stand of trees. 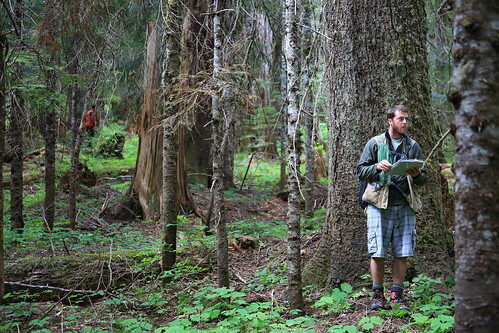 These trees had been tagged and measured a decade ago as part of a long-term study of succession and climate change, and students from the University of Washington were returning for the third time to check on the progress of their subjects. Some trees had died, some that had been too small to include five years ago had reached maturity, and others had undergone the slow, steady progression of most living things, getting larger and thicker in the middle as they aged. It wasn't the group I was looking for, bt the stories they had to tell were just as interesting. 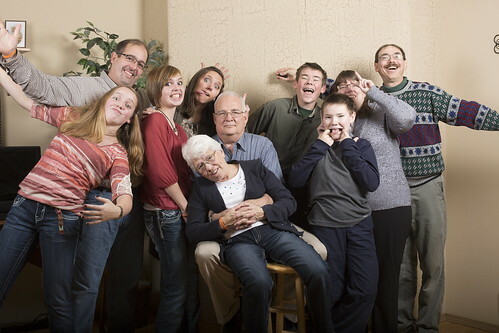 My goofy family, a photo by The Bacher Family on Flickr. Beautiful couple, a photo by The Bacher Family on Flickr. 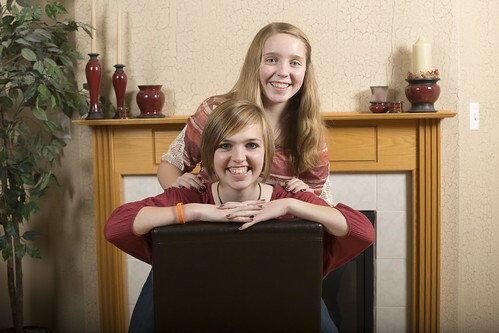 Lisa and Jon, photographed in their home on November 22, 2012. 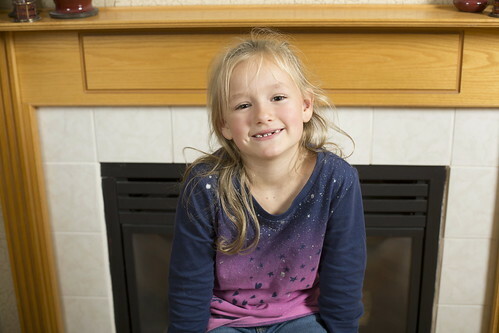 Jessica, a photo by The Bacher Family on Flickr. 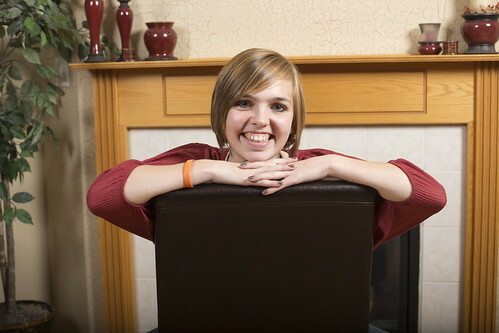 Jessica, photographed in Albany on November 22, 2012. Stephanie, a photo by The Bacher Family on Flickr. 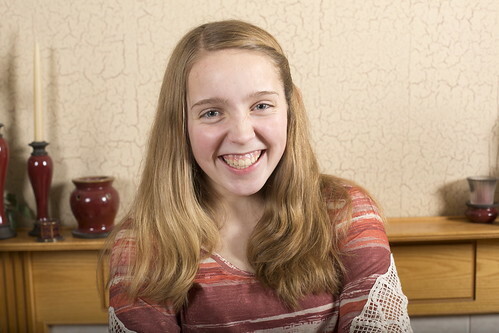 Stephanie, photographed in Albany on November 22, 2012. 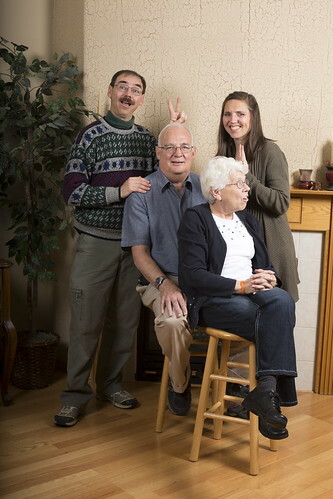 Dad and Mom, a photo by The Bacher Family on Flickr. 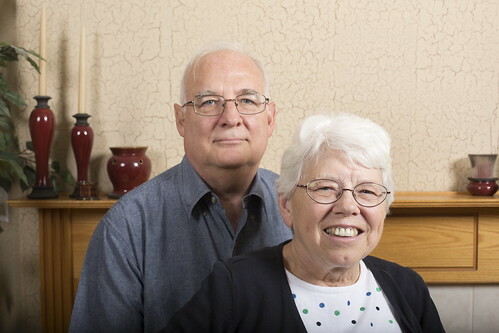 Don and Judy, my father and mother, photographed in Albany on November 22, 2012. 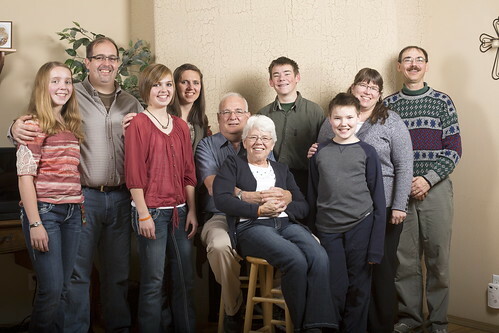 Family tree, a photo by The Bacher Family on Flickr. 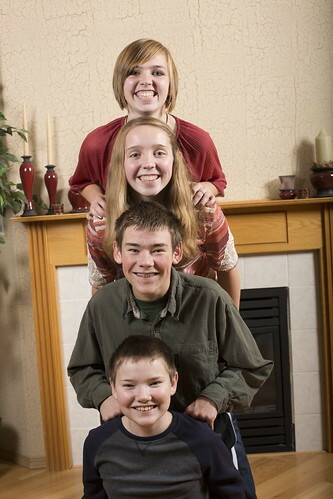 Jessica and Stephanie and their cousins David and Daniel, photographed in Albany on November 22, 2012. 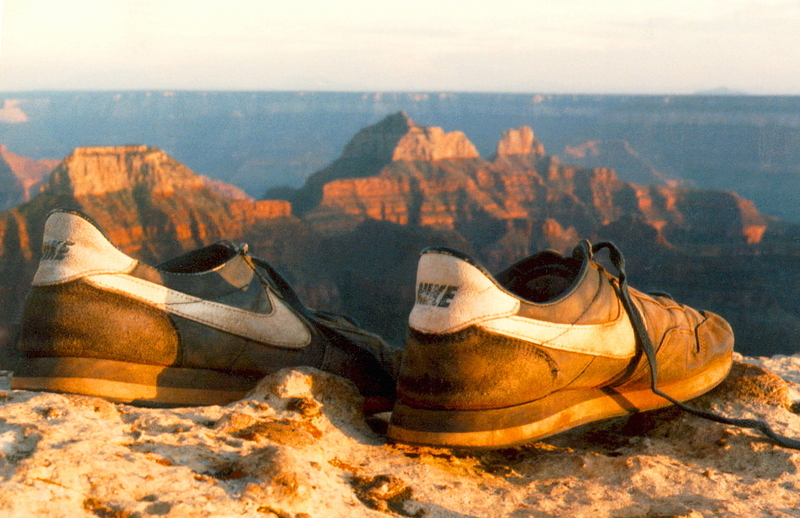 Brothers, 2012, a photo by The Bacher Family on Flickr. 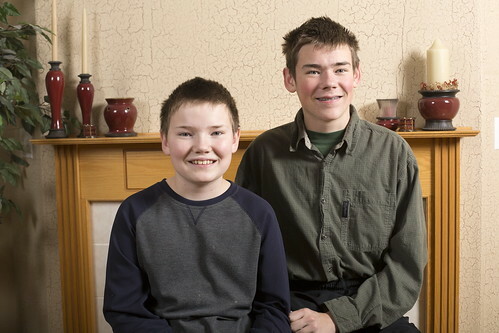 Daniel and David, photographed in Albany on November 22, 2012. 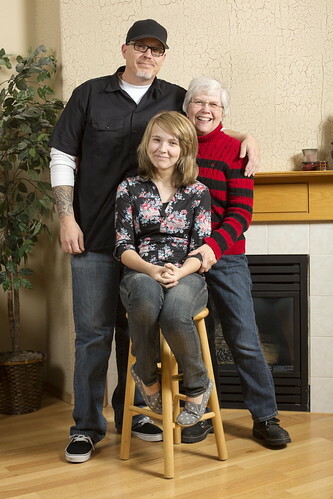 Three generations, a photo by The Bacher Family on Flickr. 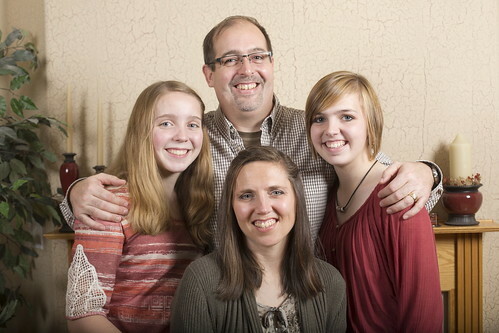 Brian, Madi, and Jewell, photographed in Albany, Oregon on November 22, 2012.